As one of the most historical raw materials for houses, furniture and even vehicles, wood continues to win increasing popularity. Ancient Chinese people were so smart that they made wood into mechanical arms. No matter how luxurious a type of wood is, however, it can not last as long as metals. A new type of metal, which is likely to replace wood in many areas, has recently come into fashion. It’s called wood transfer printed aluminum extrusion, obtained by printing wood designs into the surface of aluminum extrusion using special processing methods. This new type of material has been applied by furniture manufacturers. Closets made of aluminum extrusion of wood transfer print give a natural sense of wood with vivid deceptive designs. According to the manufacturers, the new type of closets has not a few advantages over traditional wooden ones. First, they are more environmental, which means they can be recycled after being discarded. Second, they can last decades without distortion or changes of look. The thin layer of coating gives extraordinary anti-rust performance. Third, they are more fire proof and water proof, a common nature of all metals. Fourth, they weigh lighter. Aluminum extrusion proves to be the lightest of all metals. Real wood furniture, if you have tried, is really heavy. Even a wooden furniture may be twenty to forty kilograms. 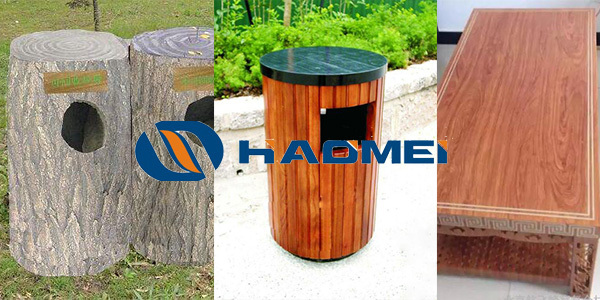 Except for furniture, wood transfer printed aluminum extrusion can also be used for wall boards, advertising boards and even dust bins in public places. Many neighborhoods have wood-like loud speakers hidden in grass and bushes. They match the surroundings so perfectly that it is difficult for people to find them out without careful observation. There is no doubt that wood-like aluminum extrusion will turn into more creative items in the future. Welcome to contact us at april@aluminumhm.com, leave a message below or wechat/whatsapp 008615838029491 for more information.